The new 5 series, shown, is more agile than the current car, says Adrian van Hooydonk, BMW Group design chief. LISBON, Portugal -- BMW is aiming to recapture its crown in the mid-sized luxury sedan segment with a sleeker-looking, larger and more technologically advanced 5 series. The sixth generation of the 5 series “is the way a BMW sedan should be with aesthetics and efficient dynamics,” said Klaus Draeger, BMW AG board member for r&d. Draeger expects the United States will continue to be the car's top market. BMW held a press event here Thursday to discuss the new 5 series, which goes on sale in Europe in March and in the U.S. in June. A hybrid version of the 5 series is expected to debut as a concept at the Geneva auto show in March. BMW hasn't confirmed whether the hybrid or a diesel 5 series will be sold in the United States. Worldwide, Draeger said, the 5 series was the best-selling sedan in its segment for four of the past seven years. 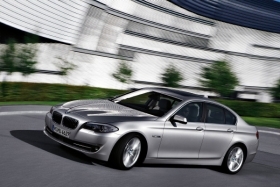 Sales of the 5 series peaked in 2006 at 56,756 cars. The biggest criticism of the current-generation 5-series car is the bulky appearance, primarily because of its side styling. That has been changed in the new generation with a design that “makes the car look lighter and more agile -- especially from the side view,” said Adrian van Hooydonk, director of BMW Group design. The new 5 series is 1.6 inches (40.6mm) longer with a wheelbase 3.1 inches (78.7mm) longer than the current car. • A new front double-wishbone chassis that improves stability. • Features that boost fuel economy by up to 15 percent over the current generation, including brake energy regeneration, an eight-speed transmission, electric power steering and new powerplants. • Luxury features that have migrated down from the year-old 7 series, such as a head-up display, lane-change warning, stop-and-go cruise control, and rear- and side-view cameras. The 5 series also has a parking assist option not available on the 7 series. In Germany, the 535i price has gone up about 2 percent to 50,300 euros (about $71,120), Wuest said. The current-generation 535i costs $52,125 (about 36,870 euros) including shipping in the United States. In the United States, in addition to the Mercedes-Benz E class, the 5 series competes with the Lexus LS and Audi A6. Last year, BMW sold 40,109 5-series sedans and station wagons in the United States -- a 13 percent decline from 2008 in a light-vehicle market that fell 21 percent last year. Mercedes-Benz sold 43,702 E-class sedans and coupes in the U.S. in 2009 -- a 12 percent increase over 2008 after the all-new sedan debuted last June. The convertible, station wagon and diesel variants go on sale this year. The Lexus LS slumped 44 percent last year to 11,334 units. Audi sold even fewer A6 models, with sales down 43 percent over the prior year to 6,786 cars.